First, I watched these Youtube clips of Gianna Jessen giving a speech in Australia. Here are the clips, again, and I would heartily recommend that you spend your time watching them, rather than read what I have to say about her book. I almost didn't want to write my thoughts on this book up at all. However, I didn't think that was very fair. I pick on a lot of books that I dislike. Usually though I disagree with the message the book is trying to present and so I don't have any qualms about telling you, "I don't like _______ and here's why." In this case, I am adamantly opposed to abortion and have no problem saying so time and time again. To come across a pro-life story is interesting to me and, I had hoped, inspiring. However, I can't say that Gianna: Aborted, and Lived to Tell about It was very inspiring. Mostly I found it to be annoying. For one thing, the book is very poorly written. The author does an incredibly bad job of telling her story through conversations and the perspectives of Gianna and her adoptive mother, Diana. The way that Renshaw attempts to weave together Gianna's abortion induced birth story and represent the family members is incredibly distracting and comes off unpolished and even a tad bit nauseating. 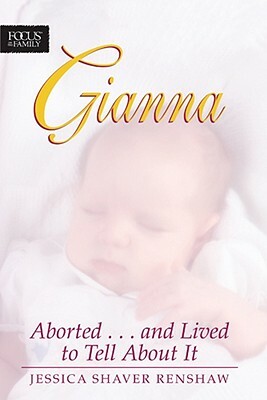 I was hoping just to get Gianna's abortion story and the title of the book suggests that my expectation was reasonable. It was that, at first. The book opens by giving the birth mother's experience of going to an abortion clinic to abort her baby via a saline abortion. However, Gianna was born alive and was rushed to the local hospital where she received life support and care. This book tells of how Gianna was moved into a foster home, was eventually adopted by Diana's family, and how it came to be that Gianna launched on a speaking/singing career. You do get the facts, the doubts that certain people had that Gianna was actually aborted, and the proof that this did in fact happen to her. 2. She desired to paint a picture of Gianna as a typical girl that you would meet on the street. She wanted to assure the reader that Gianna is a normal human being with passions just like the rest of us. I believe she wanted to put a human face on the issue of abortion. Certainly I sympathize with that (and even agree with it!) I just think it was poorly done. This might be due to the fact that this book was written when Gianna was in her teen years and primarily highlighted her life from ages 14 to 17. Having been a teenage girl, I have little patience or tolerance for the swinging emotions of teen girls and the emphatic statements that they make. Gianna LOVED Amy Grant. Gianna REALLY WANTED a boyfriend. Gianna had a BEST FRIEND FOR LIFE! Things like that. They just got under my skin and bothered me to no end. I wasn't interested in those particulars and that information was pieced together in a form and fashion that felt a bit useless and chaotic to me, instead of focusing on Gianna's life mission - to speak out against abortion. I find much more to identify with in the adult Gianna (the one in the video) than in the teenage one. I like her passion and drive and willingness to step out and deliver an unpopular message. I like her devotion to truth and life and her enthusiasm for the life that God has given her to live. I admire Gianna Jessen, the adult, very much. I like her story. It's unique. It is eye-opening. It is emotional, yes, because it deals with a heavy topic: life. You can't expect her story not to be emotional any more than you should expect someone who has been held captive by an enemy army or nation to be ho-hum upon their release. You should expect Jessen's story to produce an emotional reaction in some form or fashion. Her story provokes both sides of the issue. I think Jessen's story is incredible and from the videos I've linked above I think you will be inspired by her words and challenged to take a stand for life. Desperately, I wish this book about her did the same thing but I can't say that it does. It's a quick read, I'll say that much for it. It's not something I'd say, "Don't read this!" but I do have to honestly tell you that it's not a captivating read, nor is it written well. It just . . . is. I found it disappointing in the end. Not because of her birth story. Just because it focused too much on her teenage emotions and was written at a time when her speaking career, if you will, was just getting off the ground. Public beginnings can be a bit shaky and that's how I feel about this book. It's shaky because it paints a picture of Gianna at 17. Her more mature self is much more interesting. I'm pretty sure the same could be said for the majority of us. Gratefully! So I can't write it off completely but it didn't hit the spot that I hoped it would. Just sayin'. It's been a very long time since I read it, but I do remember liking the book. But I can't remember any of the details. It's probably past due for a rewrite, both to update what's been going on in her life and and also because she's probably more polished as a communicator now. She should probably write it herself. I agree with Barbara--time for an update! I was also thinking it would be good for her to write an autobio. Wow, I had not heard of Gianna. What a powerful story! That's a shame. Makes me think about the nature of life stories though -- always changing. I just can't imagine TELLING a child they came into my home because their birth mom aborted them. Somehow I think that's a topic I'd save until she was an adult. But I say that having never read this book. I do remember hearing her story of Focus on the Family years ago. SMB - Well, she was a tween (if I remember correctly?) when she was told and her mom only told her because Gianna guessed and outright asked the question. I think her adopted mom felt the same as you in thinking it best to wait and have that discussion when she was older. Anyhow - yes. That would be a VERY tough situation! At the same time, it makes her testimony and story very powerful.